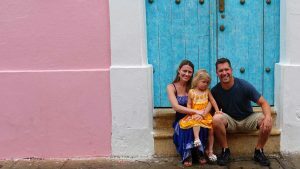 When traveling with kids – particularly young children – it’s a bit more difficult to fit in as much as you typically could when traveling without a tiny sidekick. On our trip to Japan, we decided to spend 3 days in Kyoto, one of Japan’s most popular cities. 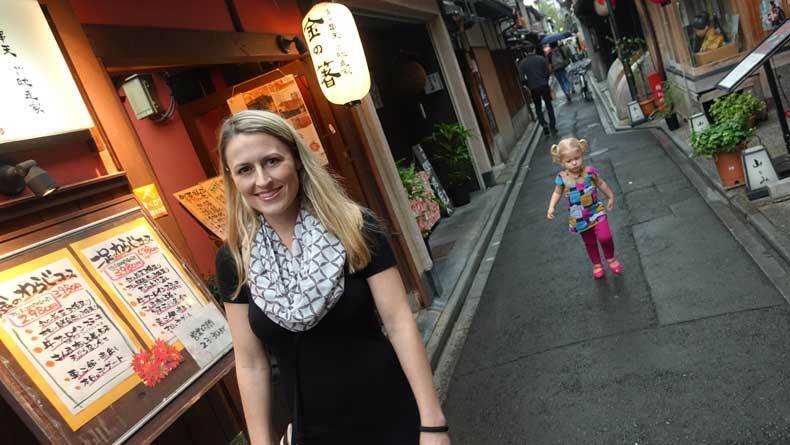 And when visiting a city like Kyoto with kids, it’s sometimes tough to narrow down what both you and your children will enjoy. When laying out our Kyoto itinerary, or our itinerary for any trip, I always keep a few things in mind. -First, I decide what I want to see most and plan to hit those stops at the beginning of the day. Kids can often throw a curve ball into your day, so putting the most important stops first ensures that you won’t miss something you really wanted to see. -Plan for things to take a little longer than usual when traveling with kids. If a review says it will take two hours to explore a tourist site, I plan for it to take three hours, knowing our little girl does things at her own pace. So now that you know how I planned our itinerary, here is a break down of each of the three days in Kyoto. 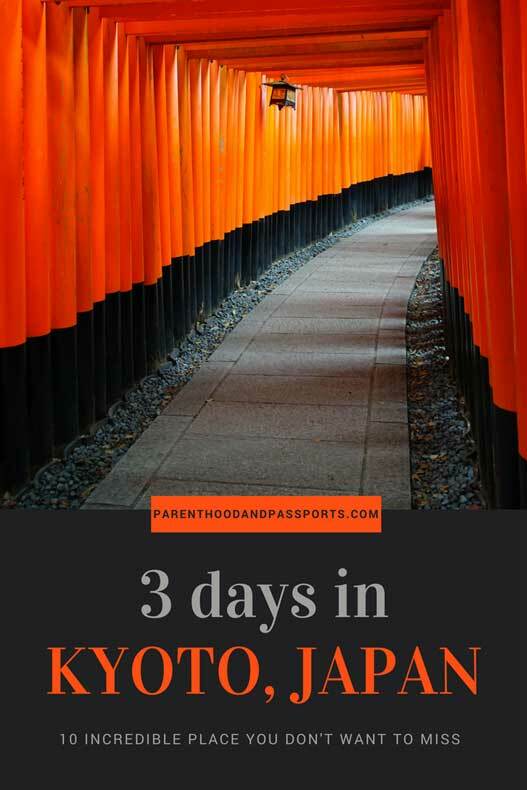 There is so much to see and do in Kyoto with kids. But before heading to Kyoto, we spent a day in Nara on our way from Osaka. This is an easy day trip from either Kyoto or Osaka, and it was one of the highlights of our trip. It is only about a 45 minute train ride and is included on the JR pass, if you purchase one. Kids especially will love meeting and feeding the city’s protected deer. 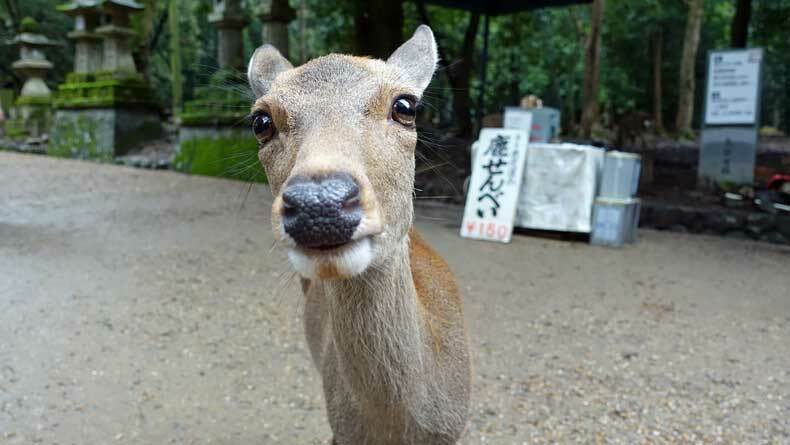 READ OUR POST ABOUT NARA HERE. Arriving in Kyoto in the evening, we didn’t have a lot of time to do much the first night. We stayed in a wonderful townhouse in the Gion district, also known as the geisha district. We spent the evening exploring the vibrant atmosphere of Gion. If you’re lucky, you may even spot an actual geisha. The geishas are extremely reserved and are escorted by security detail, so don’t expect them to stop and pose for a picture. In fact, getting a picture of a geisha requires standing outside a tea house like paparazzi with your camera ready. While exploring Gion we saw a large crowd gathered around a car parked in front of an entrance to a nondescript building. Initially, I thought it was the line to enter a popular restaurant. 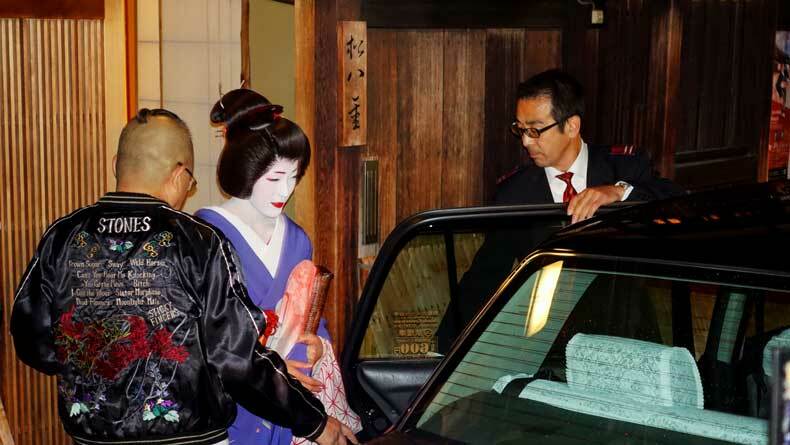 Just as we were standing there looking for a menu or some type of distinguishing signage, a geisha and her maiko, or apprentice, were escorted out of the building and into the car. It was a bit like seeing a unicorn, a Hollywood celebrity, or a member of the Royal family. The excitement instantly peaked and everyone started snapping photos. Of course, this isn’t the only way to see the geishas. You can also book a dinner performance with a geisha or maiko, but it isn’t cheap. BOOK A MAIKO DINNER PERFORMANCE HERE. That night we found a small sushi restaurant in a narrow alleyway and enjoyed a quiet dinner while our daughter slept peacefully in the child carrier. These dinners are few and far between when traveling with kids, so we relished the experience. 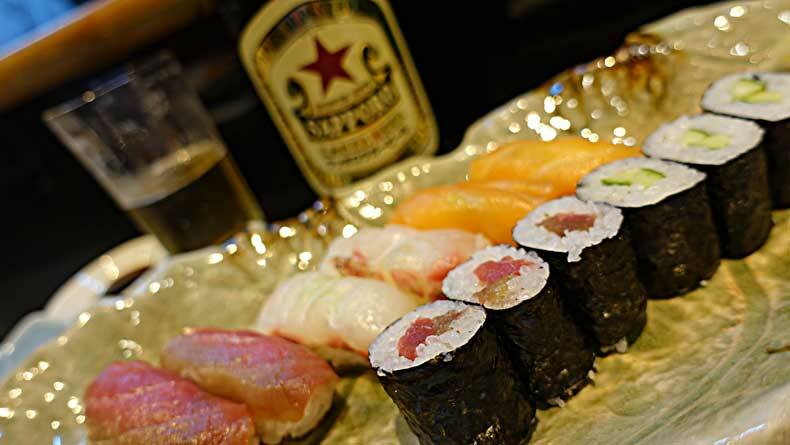 You will find a number of these small sushi restaurants tucked inside the narrow alleys. They typically seat 7-10 people at a time, but never seem busy. Love nature? The Bamboo Grove in Arashiyama is a great place to explore in Kyoto with kids. 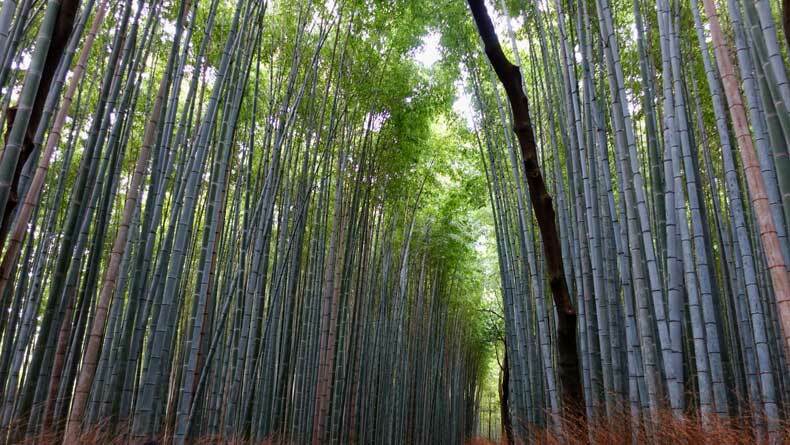 Start your day EARLY by visiting the bamboo grove in Arashiyama. Getting an early start is actually one of the best lessons I’ve learned from traveling with a toddler. Places that are typically over-crowded might be completely empty. Unfortunately, that was not the case when we visited the bamboo grove. Holy cow was it crowded! It was a cool, rainy day but that didn’t stop what seemed like thousands of people from visiting the grove at the same time we did. The bamboo grove is free to enter and is literally just a short walking path through a bamboo forest, so you can visit at any time. Perhaps we did not arrive early enough. I would recommend going around sunrise if you really want to beat the crowds. Arashiyama is great, so spend a bit of time exploring this district of Kyoto with your kids. We particularly enjoyed the nature walk to the river. We were practically alone for this portion of sightseeing. Almost all the tourists go through the bamboo grove then turn around and leave. So if you are looking for a bit of solitude or a peaceful experience with nature, keep walking beyond the bamboo forest. From Arashiyama we headed to Kinkaku, also known as the Golden Pavilion. 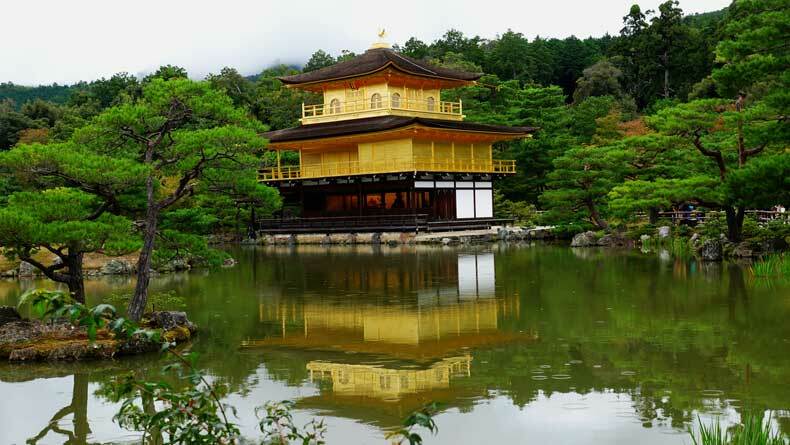 The golden pavilion is probably the most photographed spot in Kyoto. The gold-plated pagoda sits on a large pond. It is definitely more beautiful in person than in pictures. The grounds surrounding the pavilion are equally as impressive. Our toddler loved spotting the fish in the coy pond. Initially this was going to be where we started the third day, but since we finished our tour of the golden pavilion around 2pm, we figured we would head to the famous shrine on day two. 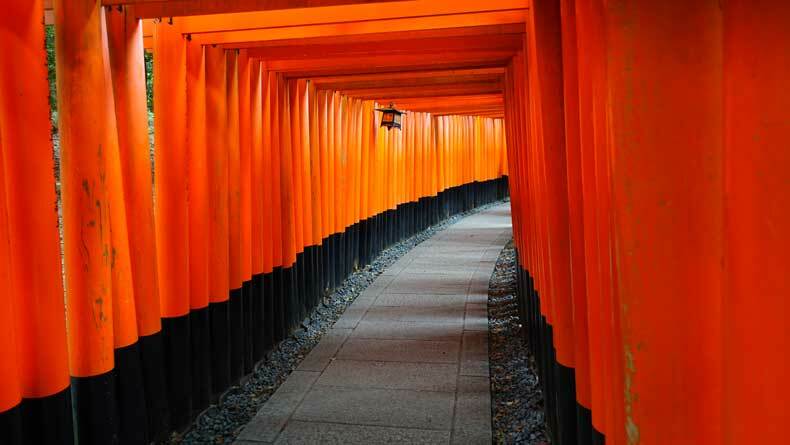 The shrine takes you through thousands of bright orange torii gates which wind gently up a hill. Each torii gate was supposedly funded by a donor after a wish came true. So you are literally walking under thousands of granted wishes. There is lot of walking and a lot of steps so it is definitely not a stroller-friendly attraction. We let our toddler walk through and explore, and when she got tired we carried her in our child carrier. The shrine was busy, but not terribly so considering the hour. It is also free to enter, which is a huge bonus for those on a budget. On our way back to our apartment, we took a stroll down the Potocho alleyway. The narrow street runs parallel to the river and is lined with quaint restaurants. Some offer outdoor seating overlooking the river. While it was picturesque, I believe all of the small alleyways in Kyoto are beautiful, so if there is one thing you need to skip, this would be it. After a long day of exploring Kyoto, we headed back to our apartment in Gion and took a dip in our private, outdoor tub. What kid wouldn’t love that!? Once again, we started our day fairly early. 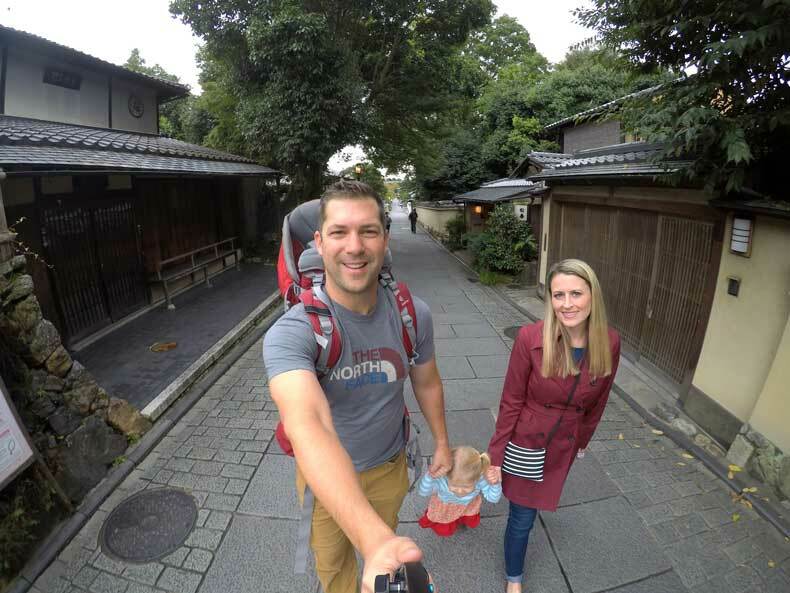 We were out of the apartment by 7am and headed straight to Higashiyama to roam the streets. This district is home to two of the most charming streets in Kyoto, Ninenzaka and Sannenzaka. 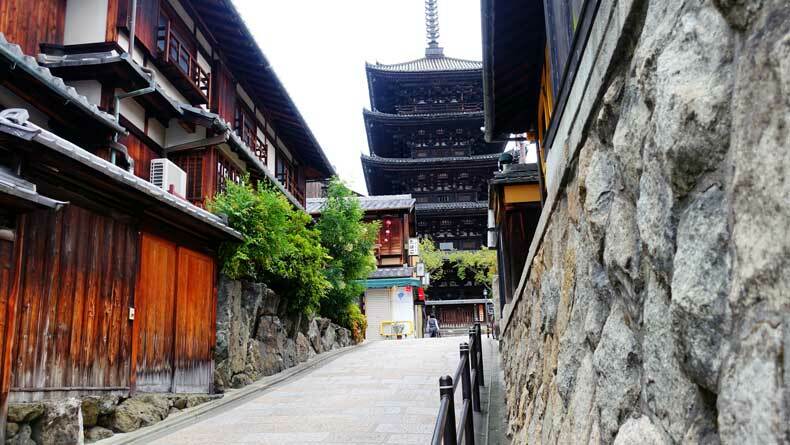 The streets lead up a slight slope to the Yasaka pagoda, the tallest pagoda in Japan. Since we got to Higashiyama early, the streets were mostly empty, which made for some stunning pictures. Next, we headed to the Ryozen Kannon war memorial dedicated to those who died in the Pacific War. 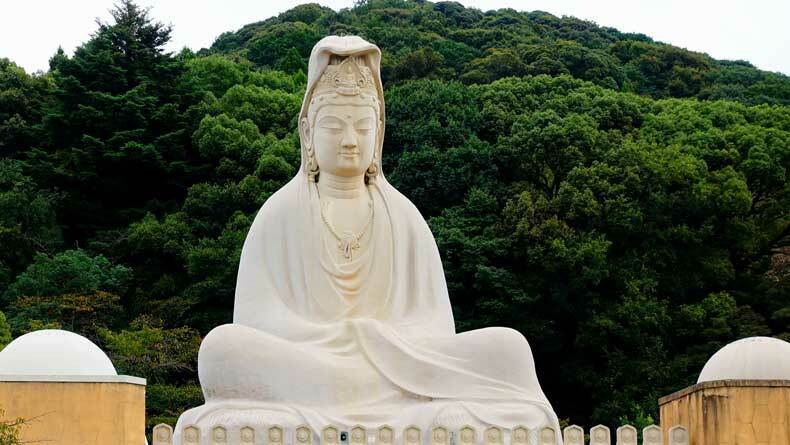 The highlight of the memorial is a large statue of the white robbed Kannon set against a lush green, mountainous backdrop. Kannon is a Buddhist deity of mercy and compassion. The large statue is breathtaking, and you truly feel a sense of peace while you’re there. We then headed to the Kodaiji temple. The temple sits directly adjacent to the Ryozen Kannon war memorial. In fact, the two attractions share a parking lot. Kids will enjoy learning about different Buddhist rituals and taking part in some of them. It is a great place to learn a little about the Japanese way of life and culture. 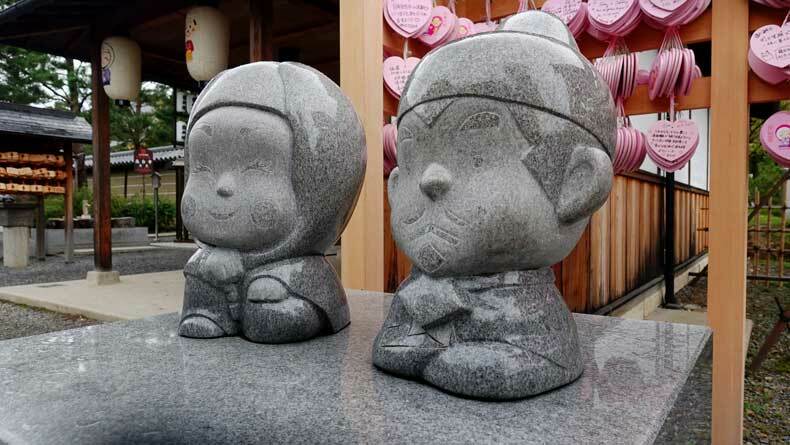 While there, my husband and I touched the statues of Hideyoshi and Nene, which are said to bring happiness in love and marriage to those who touch them. Kodaiji Temple is a fun and educational place if visiting Kyoto with kids. 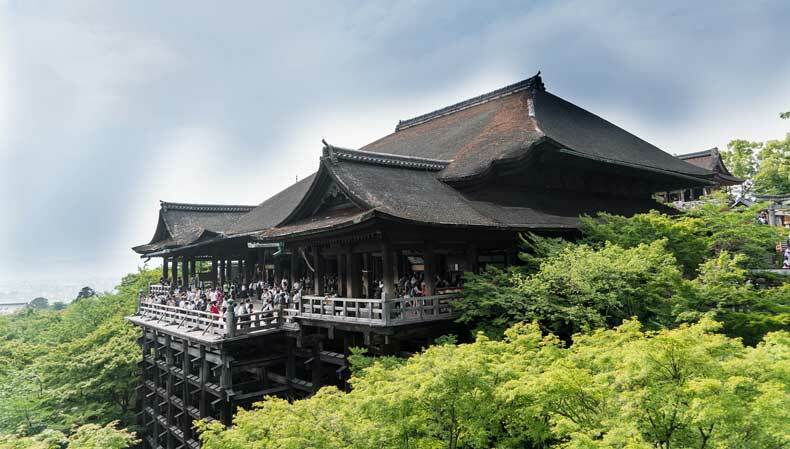 Kiyomizu-dera is one of the most well-known temples in Kyoto. You’ve likely seen pictures of the famous temple perched atop a mountainside. Known as the “Temple of Pure Water”, you will notice water is a consistent theme throughout the complex. The grounds are quite large and offer the best views of the city. It is also a wonderful spot to see the leaves change color in the fall or view the cherry blossoms in spring. Just like at Kodaiji, children will enjoy taking part in different rituals and making wishes for good health, love, or success. 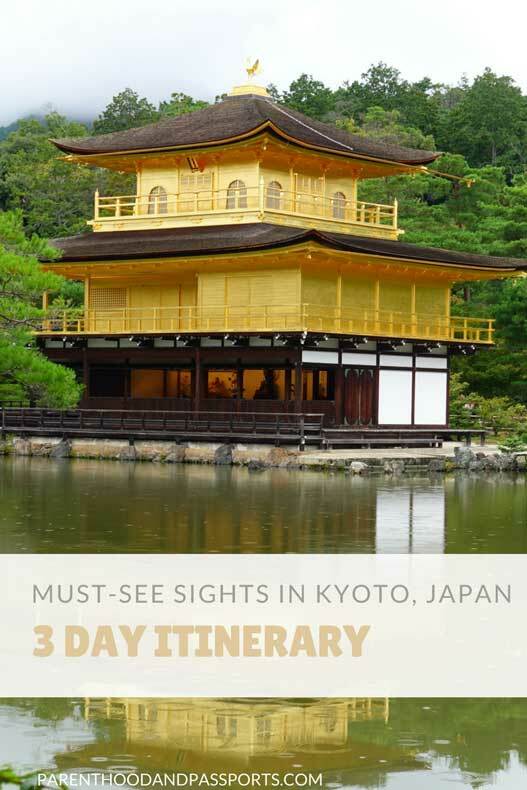 While there is much more to see and do in Kyoto with kids, with just three days, this itinerary gives you a realistic idea of what you can fit into your day without seeming rushed. Have you visited Kyoto, Japan? Leave us a comment and let us know what your favorite site or attraction was. I think my favourite place in Kyoto is Fushimi Inari shrine, but that must have been hard work with all those steps and a toddler! Nara was amazing! It was the highlight of our entire trip. Fushimi Inari was a bit difficult with a toddler. We went at her pace so it took us longer than it would probably take most people, but that’s the compromise you make when traveling with littles. We did not bring food for her. We found she would eat yakatori (chicken on a stick) in a pinch, and when all else fails there are McDonald’s and KFC restaurants readily available.